Lunch in Bryggen, the sun was in and out all day. Sloane and I had one final hike to accomplish in Voss, from our AirBnB to the train station, with all of our crap. This is where rolling luggage would have been a good choice. We made it, with a few minutes to spare, purchased our tickets, and sat down to enjoy the last leg of the scenic train ride to Bergen, on Norway's west coast. We arrived in Bergen, a gorgeous city on the water and surrounded by mountains, around 10:30 AM that day. We hailed a cab after a failure to find the correct bus, and made our way to our apartment for the next 2 nights. We dropped off our luggage, and set off to find something to eat for lunch in our little neighborhood of Bryggen. We ended up in a little cafe, ordered some sandwiches and found a spot to sit outside - and enjoyed the little bit of sunshine that would poke through now and then. After we finished our meal we headed out to explore the rest of the harbor by foot, and see what we could see. Norway has some of the best man-hole covers ever. I assume this is a scene of the Bryggen Harbor. Sloane walking past some really cool graffiti in our neighborhood. Sleeping kitty. We wandered around for a few hours and visited the local fish market, tried to visit Illums Bolighus, a Danish design store - but it of course was closed like most things, since it was a Sunday. We found this out the hard way, we were searching for an open grocery store or pharmacy to buy laundry detergent, toiletries that I had left in Oslo and some food, but no dice. We visited at least 3 places that had Sunday hours listed on Google Maps, but no one was open. We gave up around 2, when our apartment was ready and headed back to change into some hiking footwear for a light hike on top of Mt. Floyen just outside of town. Sloane outside of our city apartment. A DNT cabin at the top of Mt. Floyen, the North Sea in the background. It was a very unexpected, and incredible view - and we were alone - most of the folks who rode the tram up here didn't make it past the gift shop, we were pretty glad we did. Our best impression of Jack and Rose from "Titanic" - this view, with the light just poking out below the cloud layer was incredible. Below is Bergen, and beyond is the North Sea. Another view of Bergen from the porch of the DNT cabin. I would highly recomend anyone looking into staying up here - I wish we had. As the sun began to set, we made our way back down the mountain, to the tram platform. 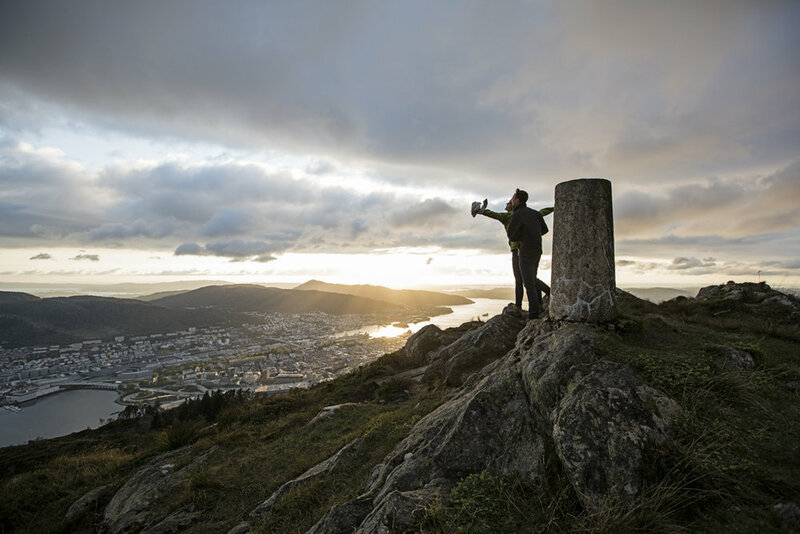 Sunset over Bergen, just off the beaten path - and away from the hundreds of other folks taking pictures of sunset. We decided to get some food at the mountain top restaurant - the Fløien Folkerestaurant - but in keeping with the days events, they had all ready shut down the kitchen. So we ordered some drinks and "salty sticks" (pretzels) from the nice gentleman at the bar and headed out on the patio to enjoy the rest of the sunset. Delicious booze at Mt. Floyen. As dusk settled in, I left Sloane with her wine and took a walk to the overlook at the top of the tram, for some night time shots of Bergen, just below us. I kept hearing what I thought were goats, and finally after lots of head scratching I found these guys, hidden under the cement overlook I was standing on. The city keeps a small herd of goats on the summit to keep the underbrush from growing up and ruining the view of the city - pretty clever. One last shot of Bergen at dusk - the bright lights on the bottom right are from the tram, which carries people up mountain from the city below. I made my way back to Sloane - who had found a stray kitty while I was gone and had made best friends with it - we finished our drinks and headed back to the tram which would take us back down the mountain to the city to find an open restaurant. We made our way back to Bryggen, and the fish market - which had people dining outside - a good sign! We found an open restaurant - I don't even remember which one, but they had the most amazing mussels and we were very, very happy. We sat, ate and drank outside, right beside the harbor, under the glow of heat lamp - watching a full moon rise over Mt. Floyen - it was perfect, except for the extremely drunk guy who decided he was going to woo the woman eating alone behind us - he failed. When we were done eating, I decided I wanted to get a quick shot of Bryggen from the harbor, so I left Sloane once again, to go on a photo safari. I was gone for what I thought was ten minutes, but after making quick friends with a man from Poland, who also happened to be photographing the moon, I had let more time than intended pass (it was more like 25 minutes). Sloane was understandably upset when I finally caught up with her just outside the restaurant. I spent the walk home doing my best to apologize for leaving her alone - which she finally accepted later that night - after I promised to pay more attention to the time, and not leave her alone in foreign countries, at night, for long periods of time. The neighborhood of Bryggen from across Bergen Harbor, with a full moon rising over Mt. Floyen. The next day we had plans of taking a boat to see Ole Bull's Villa - a famous violinist who grew up in Norway and oddly enough tried to start a Norwegian settlement in Pennsylvania. This abandoned settlement is now Ole Bull State Park and somewhere my family I spent a lot of time while Jim and I were growing up - my parents now own property right next to the park. It turns out the Museum is closed on Mondays, along with the design stores Sloane had wanted to visit., so I went about planning a hike for us - which I of course thought would be easy - as I usually do. Our route, which was 8.7 miles and took us 6.5 hours from start to finish. It was a long day. We made a plan to hike from Mt. Ulriken, which we would take a bus, then a tram to the top of, to Mt. Floyen, which we had been at the night before. This would be a nine mile stroll on top of the mountains. We found an open grocery store right around the corner and stocked up on snacks for the day, as well as some food to make for dinner that night, and laundry detergent to clean our filthy clothes. We made our way to the bus stop, about a half mile away. We surprisingly found the right bus this time, and got off exactly where we needed to for the short walk up to the Ulriken cable car, which took us almost to the top of Mt Ulriken, the highest mountain in Bergen. The Ulriken cable car - Bergen below. Sloane at the top of Mt Ulriken, after some serious rock scrambling. The weather was looking good, with lots of clouds and intermittent sunshine. We began following the rock cairns and sign posts - on our route to Mt. Floyen. This hike was entirely above the tree line, and mostly over very rocky terrain except for the last 1/2 mile - so we would be relying on these types of trail markers most of the day, which made navigating slightly more difficult. Thankfully the signposts were very informative. Sign posts and cloudy skies along our hike. After about an hour and a half of hiking we decided to stop for lunch on a large rock. While we ate we discussed the chance of Sloane's boots falling apart on us and ruining the day. This was a problem we had noticed in Voss, her sole was delaminating from her boot, and we hadn't had time to get them repaired. So we decided to be proactive and keep the issue from getting worse. With little to choose from in materials, I found Sloane's backpack had a long thin bungee on the outside, so we wrapped it around her boot and sole mulitple times to keep the sole attached. It thankfully did the job, we had to re apply it a few times, but her sole stayed on the entire 9 miles. The tops of these mountains were gorgeous - they were covered with small and large lakes, giant boulders, colorful grasses and lichens and dotted with DNT cabins everywhere. The lakes in the foreground of this image are part of the drinking water reservoir system in Bergen. Some of the prettiest reservoirs I have ever seen. Sloane, about to begin a serious decent to the reservoirs below. The North Sea can be seen in the distance. Scrambling down to the resevoirs. Sloane by one of the signposts marking the way. in the valley below is the town of Ervik, just outside of Bergen, and beyond that is the North Sea. We powered through at least 7 miles of very windy and rocky terrain before we began to tire out and lose enthusiasm. We were at the bottom of an old ski jump, that is no longer in use, with a very steep climb ahead of us - we sat here for a few minutes and had a snack, while I reassured Sloane we would be done soon. Our small trail joined up with a much larger, and much more used trail here, we watched 3 groups of folks walk by us as we gathered energy for this final climb uphill. Fog rolling up the valley where Ervik sits. When we reached the top of the hill, we looked back and a thick fog had begun to roll into the valley that we had just climbed out of. It happened very fast, and soon we were simply hiking in the clouds, with almost zero visability. Sloane hiking through the clouds. With our energy levels at almost zero, and a thick fog that had set in all around us - we decided to cut our hike short and stick to the paved road to take us back to the tram. It was all downhill from here, and very eery. We passed old viaducts, things that looked like bunkers from WW2 and guardrails that were falling into the valleys below. In our last 1/2 mile - when we finally could recognize where we were from our hike the previous day, it began to rain, hard. We tossed on our rain coats and made a final push to get to the tram. When we finally arrived, it had stopped raining, just as fast as it had started, and we waited patiently for the tram to head down the mountain, along with a bunch of other very wet people. We got into town with enough time to make a beer run (finally) , so I did that while Sloane prepared our final Norwegian meal - which I'm pretty sure was actually Italian - although I can't quite remember. That night we finished up our laundry, and hung our clothing up to dry around the radiators and fans - since the clothes dryer didn't seem to be doing the trick. We got as much packed as we could, because the following morning, before the sun would rise we had to be on a bus headed for the airport. We made it to the bus right on time the following day, and watched the city roll by in the cover of darkness, our last glimpses of Bergen were from some very heavy eyes. As we sat waiting for our flight to board at the Bergen airport, I grew increasingly excited for what lay ahead - Iceland.